This ProX speaker case is manufactured with the Honey Comb laminated surface Design. Made with the super-sleek look of Honey Comb hexagon grids on all shell surfaces, which gives the cases an almost alien look! Also as opposed to regular laminated plywood cases from other manufacturers, the ProX Honey Comb design helps prevent minor to mild scratches. The Honey Comb Digital line design was inspired by the design of New York City Street Manhole covers which are made to handle rough and tough everyday punishment. 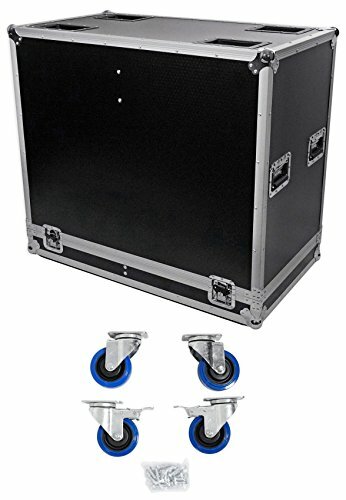 ProX XS-2X15-SPW Speaker Flight Case For (2) 15" Speakers w/ Heavy Duty Casters. 3/8 inch Plywood with Black Laminate. Inside Lined with Durable Hard Rubber. ATA Style Flight Case. 4 Recessed Spring Loaded Handles. Recessed butterfly twist latches. Black w/Silver Metallic Finish. Heavy Duty Steel Ball Corners. Aluminum Extrusion Around Caster Plate. 4 Caster Dishes on top cover for stacking. 4 inch swivel casters w/ breakes on 2 wheels. To Fit:. 2X Most 15" Speakers. Alto Professional TS115W. American Audio DLS-15, DLS-15P, PXI-15P, SENSE 15, XSP-15, XSP-15A. dB Technologies Opera 402 D, 405 D, 602 D, 605 D, LIVE 402, Opera 15 . Electro-Voice Xw15A. JBL EON15 G2, EON1500, EON15P-1, EON305, EON315, EON515, EON515XT, SRX815. Samson 612M, L612. Yamaha MSR400, SM12V, CM12V. Yorkville LS200P, NX200S, NX25P, NX35, NX55P. If you have any questions about this product by ProX Cases, contact us by completing and submitting the form below. If you are looking for a specif part number, please include it with your message.